The design process has always been central to construction, but recent years have seen its significance increase, and the ways of approaching it multiply. To an increasing degree, other stakeholders such as contractors have input at the design stage, and the designer’s role includes tasks that were traditionally the realm of other professions. This presents challenges as well as opportunities, and both are introduced, discussed, and analysed in Collaborative Design Management. Case studies from the likes of ARUP, Buro Happold, VINCI Construction UK Ltd, and CIOB show how technologies (BIM, podcasting), innovative working (information management, collaboration), and the evolution of roles (the designer-contractor interface, environmental compliance) have changed design management as a process. Starting from a basic level, the reader is introduced to the key themes and background to the design management role, including definitions of the responsibilities now commonly involved, and the strategic importance of design. Influential technologies currently in use are evaluated, and the importance they are likely to have in future is explored. 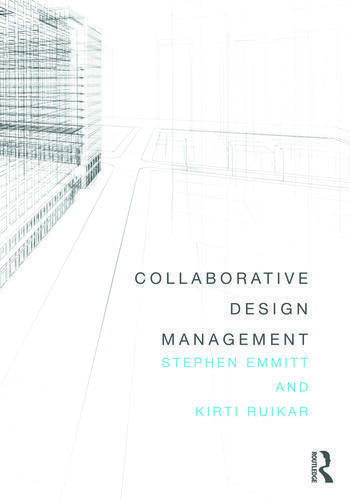 This combination of case studies from leading practitioners, clear explanations of design management roles and activities, and an exploration of how to succesfully achieve collaborative design management makes this a highly topical and uniquely valuable book. This is essential reading for professionals and students of all levels interested in construction design management, from all AEC backgrounds. Stephen Emmitt is Professor of Architectural Technology in the School of Civil and Building Engineering at Loughborough University, UK. He formerly held the Hoffmann Chair of Innovation and Management at the Technical University of Denmark and is currently Visiting Professor of Construction Innovation at Halmstad University, Sweden. Kirti Ruikar is Senior Lecturer in Architectural Engineering in the School of Civil and Building Engineering at Loughborough University, UK. She is currently Joint Coordinator of CIB Task Group, TG83 on 'E-business in Construction' and an Associate Editor of the Journal of IT in Construction (ITcon.org).